We are a Mumbai based design & manufacturing company which specialized in handicraft items like Rakhis, Diwali Decorative items - Diyas, Rangolis, Torans. We also design fashion accessories, ladies jewellery and other items. Floating candle shaped as a sunflower. To cater the variegated needs of our esteemed customers, we are highly engaged in offering a wide array of Rose Floating Candle. This is a Flower Floating Candle. Available in various colors. Available in Bee wax also.Small orders taken. 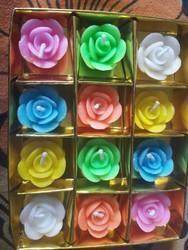 Customers can avail from us a unique range of Rose Floating Candles. These candles are mostly used for decorative purpose in homes, offices and other commercial places. The entire range is manufactured using qualitative material sourced from trusted vendors. This is terracotta basket for your floating diyas and candles, this best for your DIWALI CELEBRATION .it has a skyblue color and pink flowers.This is the best gift for your relatives and friends. Our Candle Making Machine that are Semi Automatic Hand Operated machine. Ajit Kumar Ray & Co.
We offer our customers a wide range of Floating Flower Candle. We offer a range of Floating Flower Candle that are available in multi colors and are made using high-grade paraffin wax and essential oils. 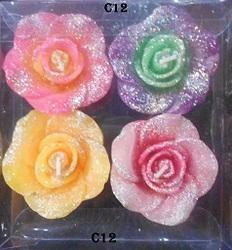 These Floating Flower candles are appreciated by large number of clients. These products are available in market at economical rates.